You are here: Home / Department Publications / BioSciences Master Reviews / Is myelination in the CNS activity-dependent or is it passive and axonal diameter driven? Is myelination in the CNS activity-dependent or is it passive and axonal diameter driven? Fast neurotransmission in the CNS relies on the myelination of neuronal axons by oligodendrocytes. Not all of the axons are myelinated in the CNS and it is currently unknown how oligodendrocytes select which axon to myelinate. A century-old idea claims that this selection is determined by axonal diameter. However, there is now evidence that myelination is regulated by axonal activity. In this review, I hypo­thesize that axonal diameter could play a role in initiating myelination and axonal activity in regulating myelination and perhaps also remyelination. Oligodendrocyte precursor cells which are present in the adult brain can carry out repair on demyelinated axons but often fail. So, a better understanding of the myelination mechanism should prove most useful for developing new regenerative therapies. Is myelination passive and axonal diameter driven? NRG1: a molecular measure of axonal diameter by OPCs for initiating myelination? Is β1-integrin sensed by OLs to determine axonal diameter? Does myelination depend on axonal activity? New biophysical techniques: an answer to the question? Myelin sheath is the multilayered membrane wrapped around axons that is synthesized by oligodendrocytes (OLs) in the central nervous system (CNS) and by Schwann cells (SCs) in the peripheral nervous system (PNS). Saltatory conduction of impulses is “allowed” by unmyelinated segments between the myelin sheaths on myelinated axons, known as nodes of Ranvier . Indeed, action potentials that are generated in the neuron are regenerated at these nodes, thus causing a more rapid and efficient mechanism for propagating the impulses when compared with the continuous impulse conduction of unmyelinated axons . Dysmyelinating diseases such as multiple sclerosis highlight the importance of such an ultrastructure for a good functioning of the brain. 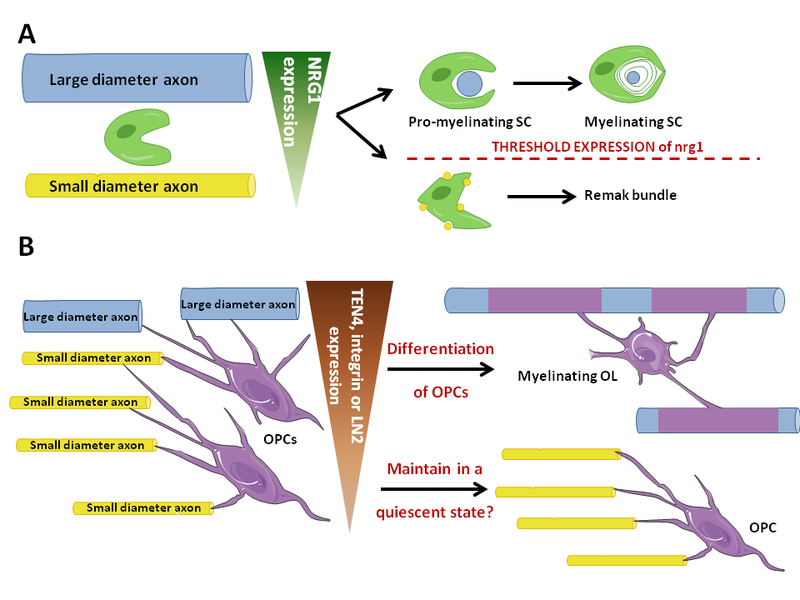 Even if OLs and SCs can become myelinating cells in the absence of axons, the presence of axons increases drastically myelination and thus seems to be essential for an efficient myelination . Myelination in the PNS is mostly regulated by neuregulin1, whereas the mechanism that regulates myelination in the CNS is not completely understood. A century-old idea claims that axonal diameter determines which axons are going to be myelinated . However, recent studies show that axonal activity seems to be a potential mechanism for allowing the recognition of axons to be myelinated by oligodendrocyte precursors (OPCs) [5,6]. Nowadays, it is not known whether myelination is passive and related to axonal diameter or if it depends on neuronal activity. In this context, new tools for studying myelination are set up, thanks to the collaboration of physicists, engineers and biologists. Among them is generation of nano fibers of various sizes to mimic axons. Studying interactions between these fibers and oligodendrocytes should permit to investigate the role of axonal diameter in myelination ••. Furthermore, optogenetics should prove most useful to study activity-dependent myelination. In this review, I will describe the recent findings about the relation between axonal diameter, axonal activity and myelination and the biophysical techniques that should lead to a better understanding of the mechanism of myelination. Axons that have a diameter smaller than 1 μm in the PNS and 0.2 μm in the CNS are not myelinated in vivo . This correlates axonal diameter with its fate to become myelinated or not. Moreover, the g-ratio, ratio of the axonal diameter divided by the diameter of the axon and its myelin sheath, is constant, usually between 0.6 and 0.7, in several kinds of neurons and in different species . Furthermore, an individual OL creates myelin sheaths of different thickness depending on axonal diameter, suggesting that local signals may be sensed by OLs . Nevertheless, Elder and colleagues  showed that SCs do not seem to sense axonal diameter but an intrinsic molecular signal. Indeed, mutant mice that had smaller axons had the same myelin sheath thickness than the wild type, proving that SCs did not change the size of the myelin sheath according to axonal diameter. On the contrary to the PNS, they proved that in the CNS the g-ratio was the same in mutant mice, thus proving that OLs might sense axonal diameter and determine the thickness of the myelin sheath in order to have a g-ratio of 0,6. However, the sensing of axonal diameter by OLs is still poorly understood. The family of Neuregulin 1 (NRG1) contains more than 15 proteins. They are divided into three groups: type I, II and III. Nrg1 type I and II are shed from the axonal membrane and are paracrine signals whereas nrg1 type III remains at the cell surface after cleavage and is a juxtacrine signal. Their effect is mediated when binding with erbB, proteins that belong to the EGF superfamily . In the PNS, NRG1 type III seems to be the essential mediator of axonal diameter detection by Schwann cells (SCs): a threshold level of nrg1 expression determines the ensheathment fate of axons  (Figure 1A). Michailov and collaborators  demonstrated that the concentration of NRG1 is the same in small and in large axons but the larger surface contacting the axon of the latter leads to a greater quantity of NRG1 presented to SCs, which could enhance myelination of these axons. Moreover, they showed that the number of NRG1 is limiting whereas the number of ErbB receptors is in excess. Thus, they suggested a model in which NRG1 is a molecular measure of axonal diameter. Moreover, a recent study of Syed and colleagues  showed that the effect of paracrine nrg1 signaling is concentration-dependent: a low concentration leads to an activation of myelination whereas a high concentration inhibits myelination. Thus, NRG1 could be involved in two distinct phases of myelination in the PNS: an initial one based on an expression of membrane-bound NRG1 and a later one involving soluble form of the protein. Whether NRG1 mediates axonal diameter sensing by OLs is still being investigated. Indeed, nrg1-/- or erbB-/- mutant mice are embryonic lethal because of cardiac malformations and die before myelination in the CNS has occurred, which prevents from studying the role of NRG1 in myelination in vivo . Moreover, only ErbB2 and 3 are expressed in the PNS while the three groups of NRG1 are expressed in the CNS, which makes the effect of NRG1/ErbB pathway in the CNS more complicated to study. Indeed, several heterodimers can be formed, which might cause different downstream signaling events. Nevertheless, recent studies avoided this problem by studying heterozygous mice for nrg1  or for erbB [17,18] or by generating conditional null mutants . It has thus been established that erbB signaling regulates maturation and myelination in the CNS by reducing the differentiation of OPCs [17,18]. Studying nrg1+/- mice  showed that NRG1 plays a role in OLs-mediated myelination but not in OPCs differentiation. Its effects are different depending on the region of the brain studied and predominantly affect the forebrain. This might be due to different responsiveness to NRG1 of OLs depending on their location. For example, erbB3 expression seems to be essential between P21 (postnatal day 21) and P35 for maintaining the g-ratio and myelin gene expression in the medial prefrontal cortex (mPFC) ••. These patterns of expression in the mPFC seem to be regulated by juvenile social interaction. Moreover, contrary to what exists in the PNS , there is no threshold of NRG1 expression needed to induce myelination. This might be due to the fact that thicker axons are myelinated in the CNS. Moreover, Brinkmann and colleagues  proved that OLS seem to have developed a NRG1/ErbB pathway-independent myelination control and that NRG1 is not essential to maintain myelin in the CNS. Figure 1. Role of axonal diameter in myelination in the CNS compared with the PNS. Role of axonal diameter in myelination in the CNS compared with the PNS. A: In the PNS, axonal diameter seems to be sensed by SCs through the level of expression of Nrg1. Consequently, SCs enwrap one large axonal diameter and myelinate it or unwrap several small diameter axons without myelinating them, thus forming a Remak bundle. B: In the CNS, a threshold level of integrin expression seems to be essential to the myelinating fate of OPCs. Moreover, Nrg1 must be expressed but no threshold level is needed to enhance myelination, which is not illustrated in the figure. Large axonal diameter axons thus become myelinated by OLs whereas small diameter ones seem to be involved in maintaining OPCs in a quiescent state. Another molecule expressed on axons and which OLs have receptors for are integrins. A recent study •• demonstrated that an absence of β1-integrin or FAK resulted in an increased threshold axonal diameter to enhance myelination. They proved that integrin signaling, just like nrg1/erbB pathway, is essential for the initiation of myelination but is not required for the formation of the myelin sheath. Thus, integrin signaling plays a role in the choice of axons to be myelinated and LN2, which expression is proportional to axonal diameter and which binds α6β1-integrin, could be a molecular measure of axonal diameter in the CNS (Figure 1B). This is interesting because the expression of α6β1‑integrin decreases as OPCs differentiate into OLs. This could be a mechanism for sensing axonal diameter that is down-regulated once the axonal diameter has been sensed and once the OPCs differentiation program has begun. A recent study proved that the cause of small-diameter axons not being myelinated might be due to a decrease of TEN4 signaling . As FAK is downstream TEN4 signaling, the results described above might reflect a role of ten4 signaling pathway as a potential molecular signal of axonal diameter sensed by OPCs (Figure 1B). Thus, it seems that axonal diameter is sensed by OPCs to enhance myelination in the CNS but the mechanisms are partially understood. Particularly, we know that NRG1 is essential to myelination but, contrary to what occurs in the PNS, not at a threshold level. We also know that a threshold expression of β1‑integrin is essential for myelination to occur but whether it is a molecular measure of axonal diameter or just part of a complex system that enables OPCs to detect axonal diameter is still unknown. These results prove that axonal diameter seems to be sensed chemically and not physically by OPCs. Myelination leads to a better transmission of neural impulses. Thus, it would seem reasonable to hypothesize that OLs myelinate preferentially axons that are electrically active. In fact, mice raised in enriched environments  and investigations about learning [24,25] showed structural changes in white matter. This might reflect the ability of myelinating cells to receive an activity-dependent signaling from myelinated axons. How these signals are transmitted to OPCs is still poorly understood. OPC-neuron synapses (Box 1) have been firstly described by Bergles et al. . These structures might reflect the ability of OPCs to detect axonal activity mediated by synaptic inputs (Figure 2A). Indeed, axonal activity results in the release of neurotransmitters. Among them, glutamate and GABA can bind glutamate or GABA receptors on the membrane of OPCs, which leads to Na+ currents in OPCs. It has been suggested that these currents are only generated by AMPA/kainate receptors . This might be linked with a preferential location of AMPA/kainate receptors on the soma of OPCs and of NMDA receptors on the processes. We don't know if these currents in OPCs lead to chemical and/or electrical signals and if it induces changes in DNA synthesis in OPCs. There is an actual debate in the literature about whether OLs still express these receptors. Indeed, some papers showed that glutamatergic receptors, that is to say AMPA/kainate and NMDA receptors, are still expressed in OLs [28,29] whereas others showed the opposite and that the expression of these receptors decreases while OPCs differentiate •. Oligodendrocyte precursors (OPCs) are connected to neurons by some junctions that share numerous characteristics with synapses. Little is known about the roles of this kind of communication between OPCs and neurons. It seems to be essential for OPCs differentiation, proliferation and mobility •. Just like synapses, these junctions are characterized by a rigid alignment and consistent spacing of neuron and OPC membranes in a small area, by the location of small vesicles and mitochondria in the axon, near the junction . Small currents have been detected in OPCs in several regions of the brain after synaptic input: brainstem, cerebellar cortex, dentate gyrus, cortex, corpus callosum and cerebellar white matter . However, it is unclear whether action potentials are delivered post-synaptically in OPCs after a synaptic input. Thus, even if they share some characteristics with neuron-neuron synapses, OPC-neuron synapses might differ from the current definition of synapses. 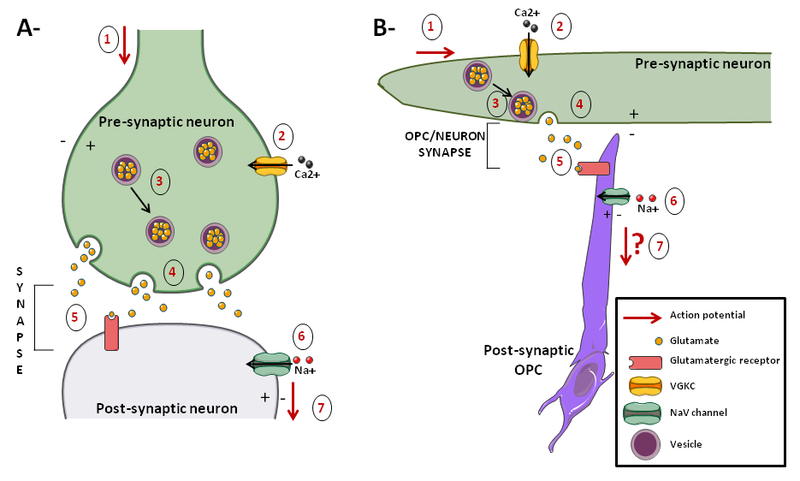 The figure below describes the morphology and functioning of OPC-neuron synapses compared with those of neuron-neuron synapses. These synapses are formed early in the development of OPCs, when they are proliferating and colonizing the brain. They are transferred to daughter cells. Thus, every OPCs are exposed to synaptic inputs, even newborn and resting cells [10,34]. A: neuron-neuron synapses. B: neuron-OPC synapses. Action potentials in the axon lead to membrane depolarization (1), thus activating VGCCs (2). Consequently, a Ca2+ input leads to local Ca2+ “hotspots” that induce mobilization of vesicles (3) and vesicular fusion at the plasma membrane (4). Consequently, glutamate is released in the synapse. Postsynaptically, OPCs express AMPA and NMDA receptors that are activated by glutamate (5). Their activation induces Na+ currents in OPCs (6), thus depolarizing these cells. In OPCs, it is unknown whether action potential results from the synaptic input. According to some articles, there might be two kinds of OPCs: one that respond to this synaptic input, characterized by action potentials and by the expression of NaV (Na+ voltage-gated) channels and one that does not because of an absence of both glutamatergic synapses and NaV channels on OPCs surface [32–34], However, these assertions are contradicted by a recent investigation that failed to detect action potentials in a subpopulation of OPCs, even if all OPCs received synaptic input by expressing NaV channels in transgenic mice . So, it is not sure yet whether OPCs can generate action potentials in response to axonal activity and it seems that OPCs are more likely to respond to axonal activity chemically than electrically. Indeed, the studies that distinguished two categories of OPCs might have in fact examined cells which were not in the same stage of differentiation of OPCs. However, as we don't know if markers stain homogenous types of cells, it is not sure whether these cells are at different stages of OPCs differentiation. 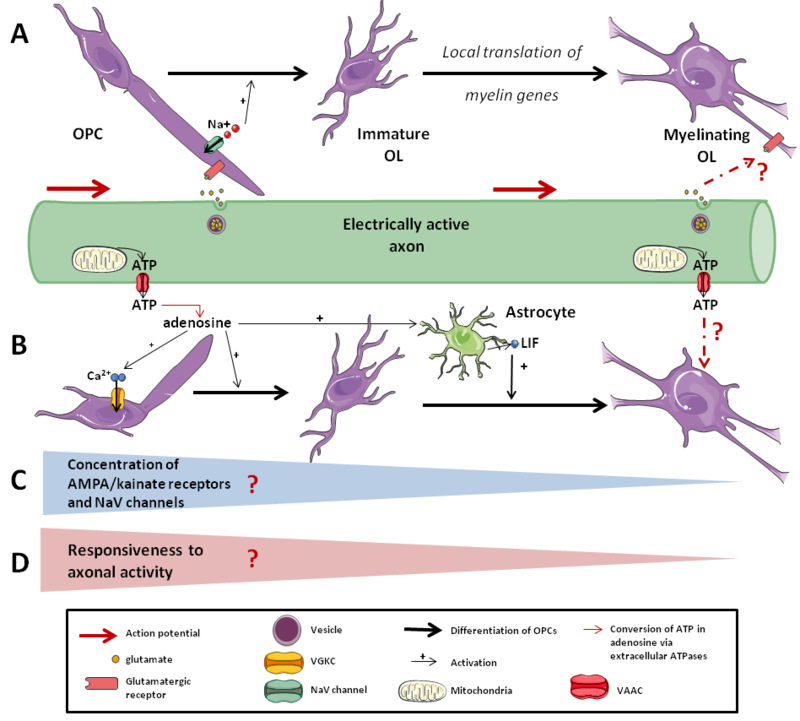 This debate is of strong interest because if OPCs can generate action potentials, then they may be able to transmit signals to surrounding neurons, which could play a major role in myelination. It is interesting to note that even when myelination has occurred, there are still synaptic inputs from unmyelinated axons to OPCs. Thus, together with local density of OPCs , synaptic inputs might play a role in maintaining the quiescent state of OPCs. Yet, the role of the synaptic input to the OPCs is unknown, except that it regulates proliferation of OPCs . Figure 3. Responsiveness of the OLs lineage to axonal activity. Responsiveness of the OLs lineage to axonal activity. A: Synaptic response to axonal activity. Axonal activity leads to the release of neurotransmitters in the synapse, which are sensed by OPCs but not by differentiated OLs. B: Non-synaptic response to axonal activity. Extra-synaptic release of ATP by axons can activate OPCs and enhance their differentiation. C: Whether there is a decrease of the concentration in AMPA/kainate receptors and in NaV channels on myelinating cells membrane during the differentiation that leads to D: a decrease of the responsiveness to axonal activity as OPCs differentiate is still strongly debated. Recent papers proved that there are several types of communication between OPCs and neurons: the synaptic one described above and the non-synaptic ones: ectopic communication, spillover and diffuse volume transmission (for more details, see •). All of these types of communication could be involved in the sensing of axonal activity by OPCs. In fact, some studies demonstrated that axonal activity activates purinergic signaling and ATP release non-synaptically (Figure 2B). Indeed, it is argued that axonal activity leads to microscopic axon swelling that activates VAACs (volume-activated anion channels). These VAACs and maybe other anionic cell- cell signaling molecules are permeable to ATP and induce non-synaptic and non- vesicular release of ATP, which could play a role in myelination •. This release of ATP can directly induce a depolarization of OPCs by activating receptors, leading to an increase of [Ca2+]i. It also activates the expression of LIF (Leukemia Inhibi­tor Factor) by astrocytes, which promotes myelin for­mation by oligodendrocytes . Moreover, extra­cellular ATPases convert ATP into adenosine, which promotes OPCs differentiation and myelination . Taken together, these results suggest that the initiation of myelination and the expression of myelin genes may be regulated by both synaptic and non-synaptic communication induced by axonal activity via the release of neurotransmitters, ions and ATP. This has been confirmed by Wake et al. ••. Furthermore, they showed that the initiation of myelination may be controlled by the vesicular release of glutamate, which enhances local translation of MBP (Myelin Basic Protein) in OPCs processes. Optogenetics and electrospinning have been developed recently and might be of high interest to investigate the role of both axonal diameter and axonal activity in myelination (Table 1). Table 1. New biophysical techniques to investigate the contribution of both axonal diameter and axonal activity to myelination. New biophysical techniques to investigate the contribution of both axonal diameter and axonal activity to myelination. Measuring the axonal activity dependence of OPCs is challenging because there is spontaneous release of neurotransmitters from axons  and because electrical stimulations of one neuron can activate surrounding neurons. Thus, stimulating OPCs with electrodes is challenging and the position of an electrode is critical for studying the role of axonal activity in myelination. New methods developed recently in optogenetics enable this kind of precise stimulation. These techniques have been defined by Dugué and collaborators  as a “combination of optical and molecular strategies to monitor and control designated molecular and cellular activities in living tissues and cells using genetically addressable photosensitive tools." These photosensitive tools are microbial opsins that conduct ions through the plasma membrane or activate ion-transporting channels when activated by light. (for more details about these light-sensitive proteins, see •). This technique is precise both temporally and spatially, enabling non-invasive activation of neurons. Added to the development of this method, genetically modified proteins can discriminate different cell types in neuronal circuits, which may play a huge role in unraveling the organization of these circuits. Recently, Prakash and colleagues  developed a technique using two photon laser-scanning microscopy that can activate precise subpopulations in a population of genetically identical cells. This technique should enable a more extended use of optogenetics in the laboratories by making it doable without specific and expensive tools. It is nevertheless still difficult to study cell-autonomous functions thanks to optogenetics. No optogenetic studies have investigated the myelination process yet. Its ability to control both spatial and temporal characteristics of a stimulation should prove most useful to investigate activity-dependent signaling. Indeed, it would be interesting to stimulate or inhibit the electrical activity of one or several neurons surrounding an OPC and to study the impact of such activities to the myelinating fate of OPCs. Studying the role of axonal diameter in myelination is difficult because both the physical and molecular properties of axons can be involved. Indeed, OPCs could sense the diameter of axons physically or thanks to molecular signals, as studies about the role of NRG1 and integrin in myelination suggest. Thus, techniques that can uncouple physical and molecular properties of axons are of great interest for investigating the role of axonal diameter in myelination. Electrospinning is a technique that creates fibers of diverse forms and various diameters . As these fibers can be cultured with cells, electrospinning has been recently used in several studies as a substitute for axons in vitro [47,48] and in vivo . This technique uncouples physical and molecular properties of axons and is thus an interesting tool for studying myelination. Lee and colleagues •• developed a technique using electrospun nanofibers as surrogate axons in order to study myelination. They cultured fibers of different diameters with OPCs and showed that there was a threshold diameter of 0.4 μm above which fibers were myelinated. Moreover, as the fibers are inert (i.e. express no molecular signals nor are electrically active) they concluded that the only parameter that initiates myelination is the axonal diameter. Thus, axonal activity may be involved in later stages of the myelination process. Of course, this finding needs to be confirmed but it illustrates that we can study myelination without axons, which is really interesting. Moreover, future developments in the technique might enable an electrical stimulation of the fibers , which could facilitate investigations about the role of axonal activity in myelination by avoiding any molecular stimulations induced by axonal activity. As drugs can be incorporated in these fibers, studies of the role of a unique molecule in myelination would be achievable. The findings of Lee et al. •• suggest that axonal diameter plays a role in the selection by OPCs of neurons to myelinate (Figure 3A). As in this study OPCs did not wrap properly the axons, we could hypothesize that axonal electrical activity might be involved in later mechanisms of myelination, that is to say wrapping and myelin compaction (Figure 3B). New biophysical techniques as electrospinning and optogenetics will be tools of strong interest to investigate the role of both axonal diameter and axonal activity in myelination. Such findings should prove most useful in research for therapeutic treatments of demyelinating diseases such as multiple sclerosis, axon regeneration after brain injuries or even mental diseases such as schizophrenia. Indeed, as there are still some OPCs in adult CNS, we could stimulate myelination by incorporating large diameter fibers or by inducing axonal activity in damaged tissues. More generally, these techniques are of huge importance in neuroscience thanks to their ability to study specific parameters uncoupled from others and to their better resolution compared with those of the common techniques used in the field. Figure 4. Two stages in the myelination process that involve both axonal diameter and axonal activity. Two stages in the myelination process that involve both axonal diameter and axonal activity. 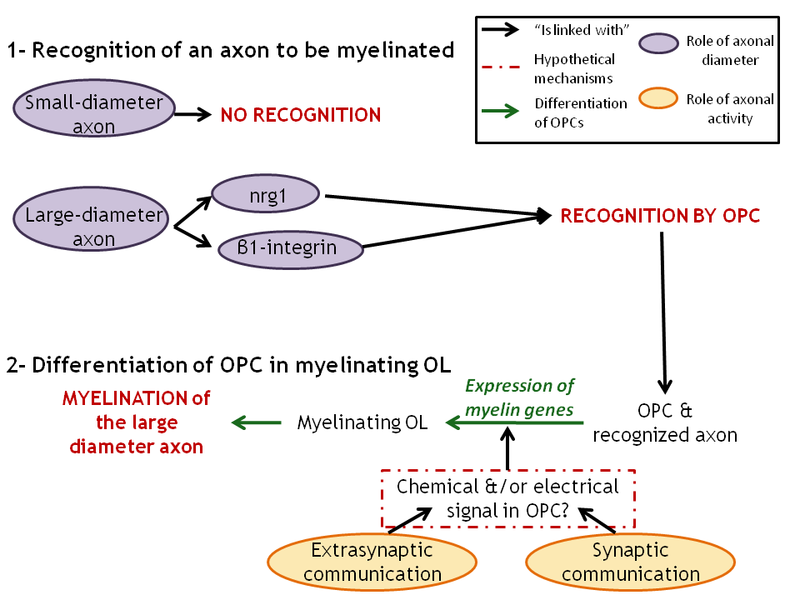 1: Recognition of the axons to myelinate by OPCs that involve axonal diameter and maybe axonal activity too. 2: Differentiation of OPCs into myelinating OLs that is enhanced by axonal activity. The nature of OPCs' response to the release of neurotransmitters and of ATP by the axons is still unclear and needs further investigations. I thank Dr. Káradóttir and Dr. Balvay for their help and their advice concerning this review. ●● A pioneer study that develops a new technique for studying myelination without axons. It shows that OPCs might sense physically axonal diameter and select axons to myelinate inertly. ●● A very interesting study that associates lack of juvenile social interactions with an alteration of the medial prefrontal cortex (mPFC) myelination and correlates it with a loss of ErbB3 and a reduced expression of nrg1. This study shows a localized role of the NRG1/ErbB pathway in the mPFC myelination. ●● An elegant analysis of the role of integrin in axonal dia­meter sensing by OPCs. It is the first paper that investi­gates the role of integrin as a sensor of axonal diameter. ● Detailed analysis of the responsiveness of OPCs to axonal activity during their differentiation. They proved that the differentiation of OPCs leads to a loss of receptors to neurotransmitters but that OLs are still able to sense neurotransmitter release from several synapses located near the glial cell. ● A very interesting paper that challenges the well- spread idea that only neurons can fire action potentials by demonstrating that some OPCs can fire some. ● An extensive analysis of the different modes of communication between OPCs and neurons. It highlights the complexity of the system and the lack of information that we have about extra-synaptic communication that might exist between axons and OPCs. ● An article of strong interest as it isolated a mechanism for non-synaptic and non-vesicular communication between axons and OPCs. They showed that axonal activity activates non-vesicular ATP release from the axon and activates a calcium response in OPCs. ●● A detailed in vitro analysis of the roles of ATP and glutamate in myelination. They showed that the vesicular release of glutamate might initiate myelination by enhancing local myelin genes expression. ● A comprehensive review about the use of optogenetics in neurosciences, its assets, limitations and future challenges concerning this technique. ● A very instructive review that extensively describes white matter synapses that have been identified a decade ago by Bergles and colleagues.